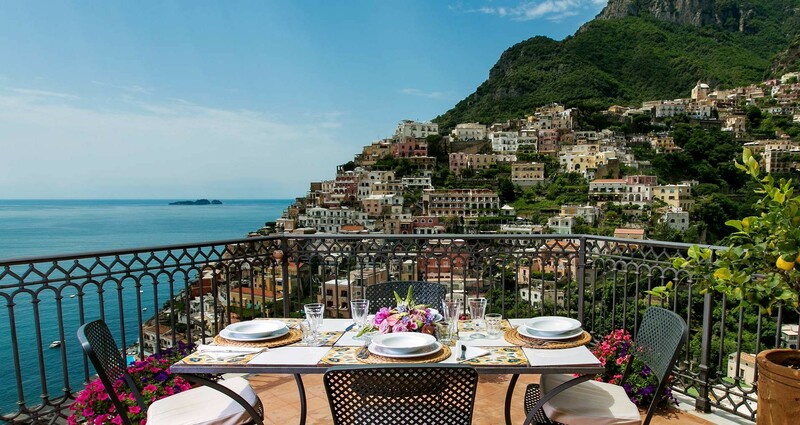 Immmersed in an atmosphere of times gone by, Palazzo Margherita offers all the warmth of a home with every comfort and a truly spectacular view of Positano. 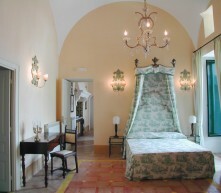 Vaulted ceilings, brightly coloured Vietri majolica tiled floors, spacious rooms with an elegant mix of modern and antique decor and huge windows and balconies that afford incomparable vistas are only some of the characteristics of the apartments of Palazzo Margherita. A stay in one of these apartments means living immersed in an atmosphere of other times, enjoying the peace and intimacy of a house with every comfort. 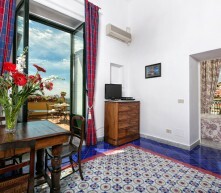 All the apartments can be rented for a minimum of seven days, with arrival and departure on Saturdays. Your apartment will be available from 4.00 p.m. on the day of arrival and must be vacated by 10.00 a.m. on the day of departure. 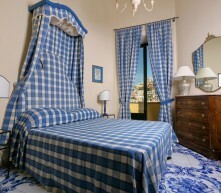 All the apartments can be rented for a minimum of seven days, with arrival and departure on Saturdays. Your apartment will be available from 4.00 p.m. on the day of arrival and must be vacated by 10.00 a.m. on the day of departure. 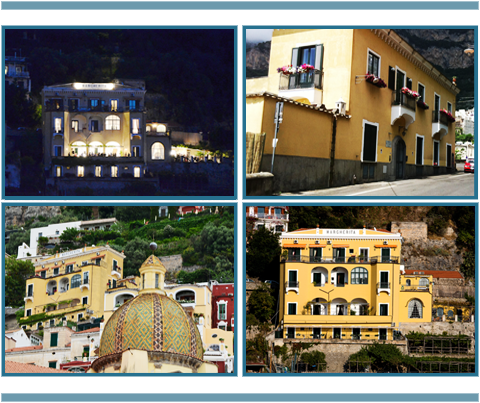 Arrival or departure at different times must be communicated on booking: booking@margheritapositano.com For enquiries contact the office at Palazzo Margherita from Monday to Saturday from 9.00 to 12.00 and from 1.00 to 6.00 p.m. or call +39 089 812 046. 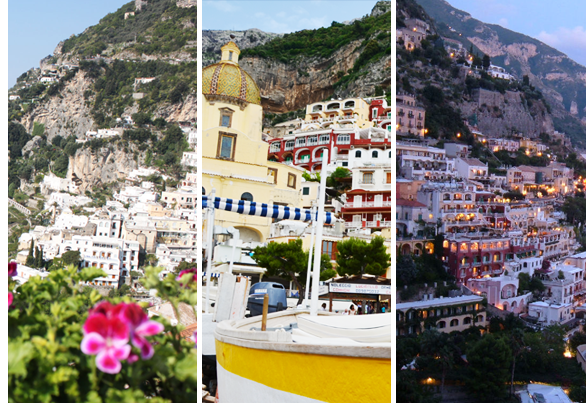 The nearest mini market is only 50 metres away, while the centre of Positano and the beaches are 10 minutes’ walk down the stairway passages. Palazzo Margherita has a garage for 2 cars. Car space should be reserved at the time of booking. No animals allowed. There are stairs in the building and to maintain the original architecture, we have chosen not to install a lift. 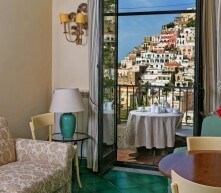 where charm and comfort combine perfectly to offer all the pleasure of a unique, unforgettable holiday. 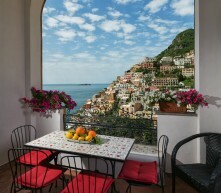 This apartment is the attic of Palazzo Margherita, with a breathtaking view over Positano and its bay. This enchanting apartment owes its name to Torre Sponda, an ancient defence tower that was a lookout post for the Saracen ships. 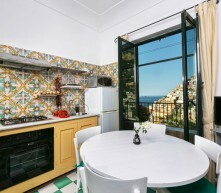 In this delightful apartment, the lively colours predominate, like the green and yellow that recall the majolica dome of the Santa Maria Assunta church, situated near the beach in the town. 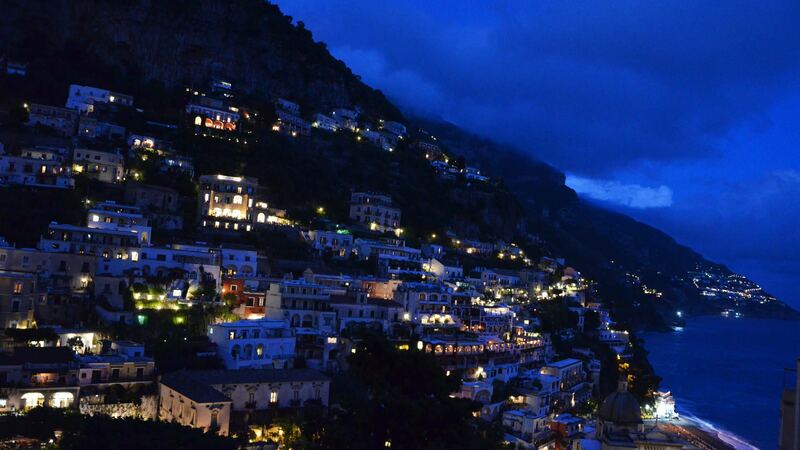 The green of the Lattari Mountains behind Positano. The silvery grey of the pebble beaches. Imagine the Li Galli isles, which according to legend was the haven of the enchanting sirens. 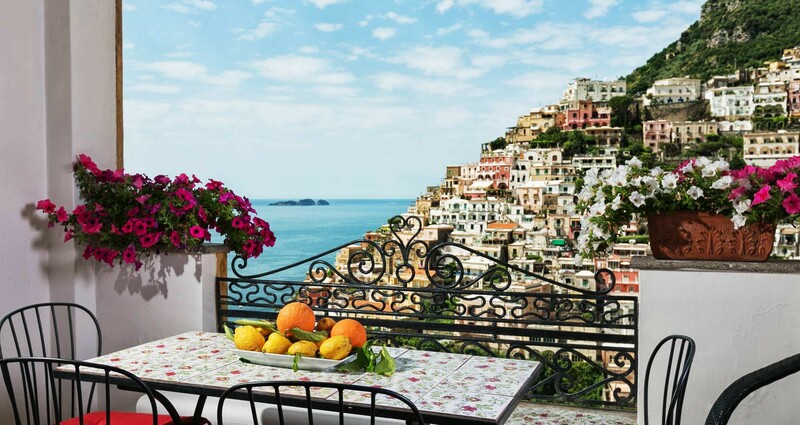 A landscape that recalls a crib scene with its white and brightly coloured Mediterranean houses perched on the terraced rock right down to the sea, where you can explore the alleys and stairway passages and discover the true soul of the places and the people. 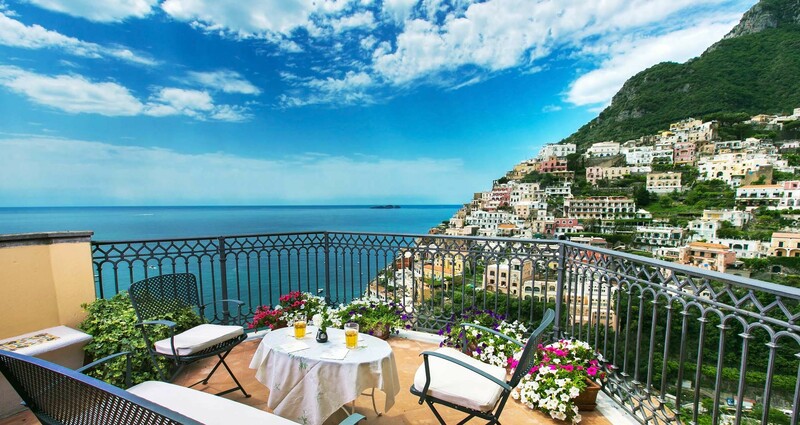 This is the Positano you see and experience at Palazzo Margherita.